MCS offers several secure email solutions for business, corporate, and enterprise clients. Some of the benefits of having a local company to host and manage your email needs is that it eliminates the need for your company to have an on-site server, deal with backups, etc. All of our email solutions include email backup and archiving systems, anti-spam, anti-virus, and can be accessed via any mobile device...We proudly boast a 98% uptime guarantee and we have failover security to protect you from email hacking. MCS Technologies is a Microsoft Certified Partner and we are proud to offer sales and support for Microsoft Office 365. Office 365 is known as a SAAS (software as a subscription), and its great for large and small businesses that want to avoid the headache of self managed software. 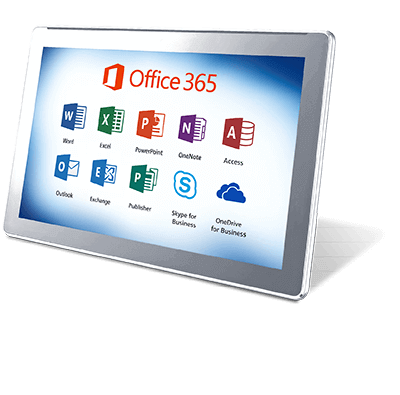 A subscription to Office 365 gives the user(s) full and local access to Microsoft word, Excel, Powerpoint, and Outlook web access. We can also Integrate and transfer your domain name to use Microsoft Exchange with is a very powerful email platform that is great for teams and is very secure boasting features like: email backup, mobile access, push reminders, its scalable, and can be setup to utilize two-factor authentication. Hosted Exchange email services are used in nearly every business today. It's a secure and virtual email platform that is tried and true and has been around forever. If you need a business email solution Microsoft Exchange is is the go-to choice of most small to large scale businesses. We use the newest version of MS Exchange software and our servers have failsafe redundancy, email archiving, backup, scaleable boxes, 99% uptime on this platform, as well as mobile sync, a very user friendly OWA, and are fully end to end encrypted. MCS's Email Plus services are for Small businesses or even individuals who already have a domain name or are just starting up and need to get an established presence and a secure private email solution. Most people ask, why not just use a gmail,ymail, or aol address - why should I pay for email? Its a great question and we understand that its hard to imagine paying for something other companies offer for free.. but the truth is having a custom email just looks better to your customers, and is more secure than the big name free services that are always being targeted by hackers. Even our basic email services are super secure using 256bit encryption and boasting features that those free services do not offer, like 24/7 support and local back end maintenance, mobile push and sync for calendars and contacts, as well as simple file sharing, backup and archival systems. Click here to Check your Email on-line. Servicing Illinois + Wisconsin, Since 2006. MCS Technologies services the following communities. Kenosha, Plesant Prairie, Twin Lakes, Paddock Lake, Silver Lake, Union grove, Racine, Burlington, Sturtevant, Caledonia, Waterford, Franklin, Greendale, Greenfield, Cudahy, Milwaukee, South Milwaukee, West Allis, Brookfield, Wauwatosa & Glendale. Chicago, North Chicago, Melrose Park, Skokie, Niles, Arlington Heights, Evanston, Wilmette, Northbrook, Winnetka, Highland Park, Vernon Hills, Lake Forest, Lake Bluff, Cicero, Norridge, Deerfield, Gurnee, Waukegan, Libertyville, Grayslake, Winthrop Harbor & Zion.